The Red Bulls, backed by an early goal from Kemar Lawrence, shoutout Toronto FC, 1-0, on Sunday at BMO Field, earning their first regular-season win there since 2013. The Red Bulls improved to 10-4-2, with 32 points, and moved past NYCFC into second place in the Eastern Conference. The two teams meet next Sunday night at Yankee Stadium in the third installment of the Hudson River Derby of the season. The Red Bulls won the first two meetings of the season, one in MLS play and the other in the US Open Cup. It didn't take long for the Red Bulls to get on the board, as Lawrence, off the first corner kick of the game, sent a low-liner from outside the box to make it 1-0. Long recorded his first career MLS assist on the goal. Luis Robles tallied a game-high eight saves for his ninth win of the season. Robles improved to 89-54-44 all-time in net as a Red Bull. Robles recorded his 54th career league clean sheet to move into sole possession of 11th all-time in league history. 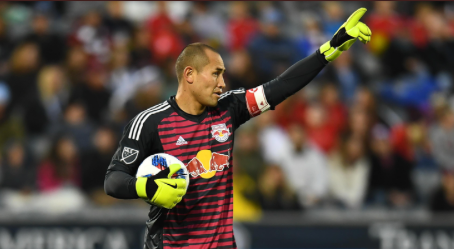 The play of the game for Robles and the Red Bulls came when Toronto FC was granted a penalty kick in the 78th minute. Robles stepped up and recorded his seventh career penalty kick save to preserve the 1-0 lead. Robles has now recorded a shutout in back-to-back matches and hasn't allowed a goal in 193 minutes in league play. Books: "The Existentialist's Survival Guide"
Books: Ainsley Earhardt's "The Light Within Me"
Books: "We Are The Clash"
Books: "Blame It On Bianca Del Rio"